I live in Hawaii and have a small fish pond. 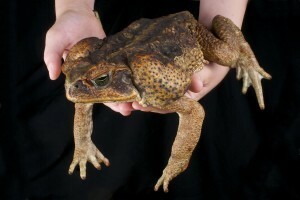 It attracts Bufo toads like crazy and they lay eggs in it. Will your toad control products help and not harm the fish in the pond? The products listed in our TOAD CONTROL article have been used successfully for Bufo toads here in the southeast for many years. And they can be used safely in yards which have pets and/or ponds with fish. The most common approach being used by our customers is to apply PEST RID GRANULES throughout the yard focusing on any path way the toads might be using to enter the property. Next, spraying the same areas with PEST RID SPRAY on top of the granules will keep them out of the yard for several weeks following the treatment. Now how many weeks will the applications last? Typically 3-4 weeks so renew them once a month to insure the toads don’t return. 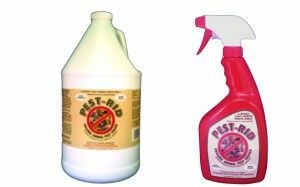 Pest Rid is ideal for yards with sensitive areas like ponds, streams or rivers because it uses nothing but food grade actives and won’t pose a hazard to people, pets or aquatic life in case of run off. For the “best” control, first apply granules. These are packed in 2 lb jars and each jar will treat 500 sq/ft. These granules will not work alone but should be used with the spray. When the spray is applied over the granules, you’ll get 60+ days of protection. The granules will absorb the spray and keep it active for at least twice as long compared to using just the spray. After applying the granules, spray over the top with LIQUID PEST RID. This comes packed in two sizes: gallons and quarts. 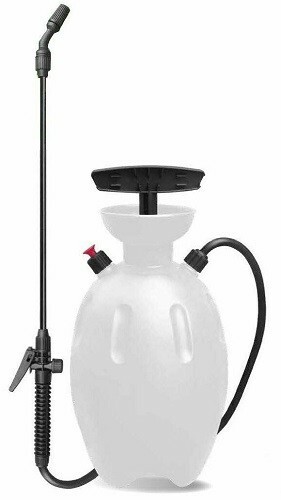 The quart jug, pictured to the right, will cover 125 sq/ft and comes with its own sprayer. The gallon does not come with a sprayer but its more economical as it will cover up to 500 sq/ft. If you get the gallon jug, you can use a simple TRIGGER SPRAYER WITH HOSE to spray it. 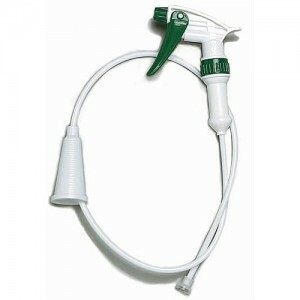 This one is handy, easy to use and comes with an adjustable nozzle. You can also use any standard PUMP SPRAYER. Since Bufo toads can’t jump higher than a foot, installing SCREENING can help keep them out of the yard too. This is a heavy gauge poly formed in a “diamond” pattern. This screening is so strong, you can use it as a fence along the base of a standard cyclone or stockaded fence. Add this to the bottom with at least 6″ of the screening buried down in the ground and 18″ up above ground tethered to the fence to make sure no frogs enter. Adding screening will keep them from burrowing in or passing through the larger fence openings. This screening is also strong enough to be set up as an independent fence. Make sure it’s at least 24 inches tall and 6 inches in the ground. 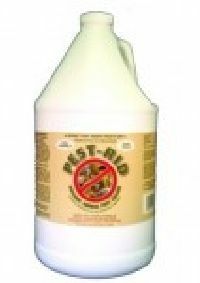 Install it around any pond or body of water you want to keep toad free; its strong enough to keep out snakes and lizards too. 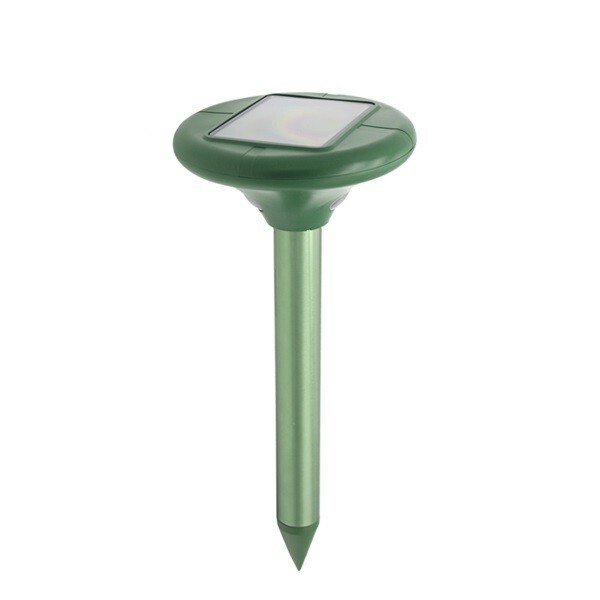 If you’re not able to install screening due to the lay of the land or cosmetic reasons, another option is our SOLAR POWERED GROUND STAKE REPELLERS. Our repeller is one of kind and not available for sale elsewhere. These units use a range of repellents toads do not like and can cover large areas too. Our design uses the sun to charge an on board battery so the device runs on its own, around the clock. The main way it works is by releasing a vibration that will both move the ground and create a sound wave small rodents, frogs and snakes don’t like. It will vibrate several times a minute constantly rotating its cycle. But it also sends out an annoying sound frogs do not like it and will avoid areas where the sound is active. In addition to the vibration and sound being released, our design also uses two LED bulbs located on underside of controller head. These light up at night showing as two subtle “eyes” when its dark. This makes the units look “evil”. Small animals like toads that naturally forage on the ground will look up and see these discreet lights and become frightened. This happens because they perceive the eyes to be coming from a predator. Combined this with the vibration and the audible sound and you can effectively keep foraging toads out of the yard for good by placing units along points of entry. To properly install units, plan on placing them along property borders spacing them out ever 60-75 feet. Coverage is circular so approaching toads will detect the unit from afar and stay clear of where they’re active. The exact coverage will vary depending on soil type. So loamy soft soil like that found along lake shores or the ocean, plan on getting 4,000-5,000 sq/ft of coverage per unit. But for hard pan, 6,500 to 7,500 sq/ft per unit will be possible and then some. Setting up these units requires a little “charging” time. They come with a little power and the head is separated from the bottom stake. We advise setting the controller head in sunlight for 1-2 days so the battery gets fully charged and ready to go to work. This way they go afield under full power making them best suited to get the job done. For more detailed directions on how to set them up, download our SETUP DIRECTIONS. One of the most important keys to having success using these devices is to get them inserted properly in the ground. To do this you will need a smooth, well drilled hole for them to fill. The hole must be the proper depth and width. 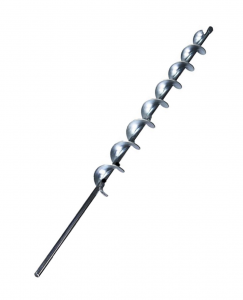 Our SOIL AUGER is perfectly designed for the task. Simply attach it to your favorite hand drill and take it out to the yard for the task at hand. Holes can be drilled in 10-20 seconds and will be just right. Plan on making the holes about 9 inches deep as units need to be installed so 1-2″ of the stake is above ground. This ensures the head unit stays off the ground.